How to Convert PDF Files to Text on Mac OS X? PDF is a read-only file format which performs an ideal role in distributing documents with original layout and other display effect perfectly preserved. But for some reasons, we’d like to copy text from PDF files for other use. That’s why we need to find out the solution on how to convert PDF to editable text documents. This article is going to tell you how to get through the conversion from PDF to Text on Mac effortlessly and quickly. To convert PDF files to text on Mac, a Mac PDF tool is needed. However, there’re so many PDF to Text conversion program on the market that it is hard to pick out which one really works. To save time and effort, I’d like to recommend you a comprehensive PDF tool named Coolmuster PDF Converter Pro for Mac, which enables you convert PDF to Text with great output quality. 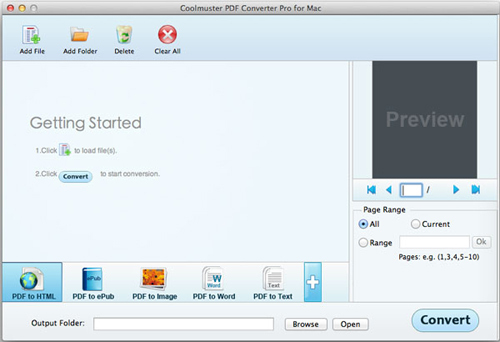 Free download Coolmuster PDF Converter Pro for Mac and read on to learn how to convert PDF files to text on Mac with it. Windows version is also available. How to Convert PDF to Kindle Readable File Format? How to Convert PDF to Microsoft Excel Spreadsheet? Click the quick start icon on your Mac desktop to launch the PDF conversion program, click "Add Files" or "Add Folder" to load the target PDF files to the software. To save your time, you can upload multiple PDF files at one time. Choose the conversion type as "PDF to Text" and then click "Browse" to set up an output folder for saving the converted text documents, make sure there is enough free space at your designated path. Tips: Default page range for the conversion is All pages. If you need, you can also customize the page numbers or page ranges of the PDF files to convert specific pages. After all the above settings, you can simply click the "Convert" button to begin the conversion on your Mac. There is a progress bar showing you how the conversion is going. Ok, you can copy and edit your PDF files as text format now. Converting PDF to editable text on Mac is quite easy with Coolmuster PDF Converter Pro for Mac, isn’t it? Get it and enjoy yourself. - Standalone program. No require of any third-party program like Adobe Acrobat.